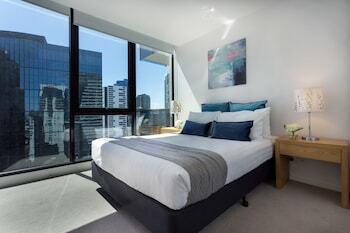 With a stay at Wyndel Apartments Southbank Views in Southbank (Melbourne Central Business District), you'll be within a 10-minute drive of Eureka Tower and SEA LIFE Melbourne. Featured amenities include express check-out, laundry facilities, and an elevator (lift). Self parking (subject to charges) is available onsite. When you stay at Kurrajong Trails and Cottages in Wheeny Creek, you'll be 18 mi (29 km) from Hawkesbury Race Club. Free self parking is available onsite. A stay at Mansfield Valley Motor Inn places you in the heart of Mansfield, within a 15-minute walk of Mansfield Oval and Mansfield Golf Club. Free self parking is available onsite. With a stay at Muse Private Hotel in Woollahra (Sydney Eastern Suburbs), you'll be within a 15-minute drive of Bondi Beach and Sydney Harbour Bridge. Limited parking is available onsite.